With Microsoft Flow, you can connect various services without knowing how to code. This is extremely exciting. We began to think about how we could bring this excitement to Kintone as well and released the Kintone Connector in January of 2018. You may think “I can do anything now? !” with the Kintone Connector, but there are a couple points that you should consider first. We’ve compiled those points into 11 sections. We’re planning on continually updating this article as well, so check back every so often! This is an overview of the Kintone Connector (Triggers and Actions) features. For your reference, we’ve also listed Webhook as a column since the Kintone Connector Trigger uses Webhooks. In the next update, we’re planning on adding even more triggers and actions, so stay tuned and look forward to that! * If you tried to ‘create a record’ and ‘bulk create records’, only the ‘create a record’ part would run. ** If you tried to ‘create a record’, ‘bulk create records’, ‘update a record’, and ‘bulk update records’, only the ‘create a record’ and ‘update a record’ parts would run. The Kintone Connector is offered only with a paid Microsoft Flow plan as a premium connector. You cannot use the connector with the version of Microsoft Flow that comes with Office 365. In order to use the Kintone Connector, you will need to enable the integration of third-party services in the “Integrations” menu of system administration. If Department Access Control (https://help.kintone.com/en/general/admin/dep_accessctrl.html) is enabled, you will not be able to use Webhooks, and subsequently, will not be able to use the Kintone Connector triggers. You will still be able to use Kintone Connector actions. If you’re using IP address restriction with kintone.com, you will need to give access permission to the following IP addresses. You can download an XML file that contains all the IP address information from the download section at the top of the page. If you don’t give permission to these IP addresses, you will not be able to use the Kintone Connector actions. Refer to the following table. You can use both Kintone Connector triggers and actions with SAML authorization. There aren’t any particular points about this that need to be kept in mind, we just thought that there might be some people interested in this and are letting everyone know just in case. Refer to the following table. Note: The Webhook event “Record is deleted” cannot retrieve field values. For more information on what parameters can be retrieved, refer to the “Event: Record is deleted” description of the Kintone Help Center article, “Creating a Webhook in an App“. The user who set up the flow will become the user who runs the requests. For the “Office 365 Outlook – When a new event is created (V2)” action, there is no option to select the organizer. Therefore, the person who set up the Microsoft Flow will be registered as the organizer. Similarly, the user that is logged into Kintone in the Microsoft Flow settings will be registered as the user that created the record. If an error occurs with the Kintone webhook, there is no feature that allows you to retry or receive an email notification. 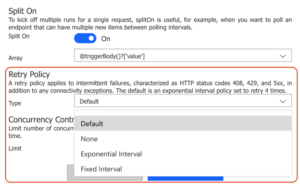 If an error occurs with Microsoft Flow, there is a retry feature. You can set up this retry policy through the options settings menu. 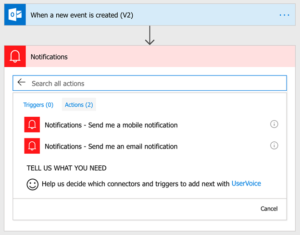 There are different ways that a notification can be sent when an error occurs, but with the standard notification feature, only the user who set up the Microsoft Flow will be notified. The connector also does not connect with Apps in Guest Spaces. As of March 2018, the available features of the Kintone Connector are still limited. Furthermore, an active method of taking care of errors needs to be established, and using the Kintone Connector with a large-scale subdomain or when errors cannot be accepted may be difficult. However, the fact that you can do various integrations without coding holds a lot of potential, and we think there are many instances in which individuals or smaller-scope subdomains will be able to use this. While we wait expectantly for the next update, let’s see how many different ways we can use this connector!